Heroic Hoka Highland Fling! | Barefoot And Running Blind! Partially sighted, limited oxygen intake, heat exhaustion, leg cramps and I’m only just hitting Conic Hill – 18miles in…! Lying in bed, night before the race, the rain is pouring down on our tin shelter. All snug in our sleeping bag, I lie there cuddling into Eil and Turry. This morning reminded me of a previous one, Devil o’ The Highlands, a VERY wet and cold, long day out on the hills. 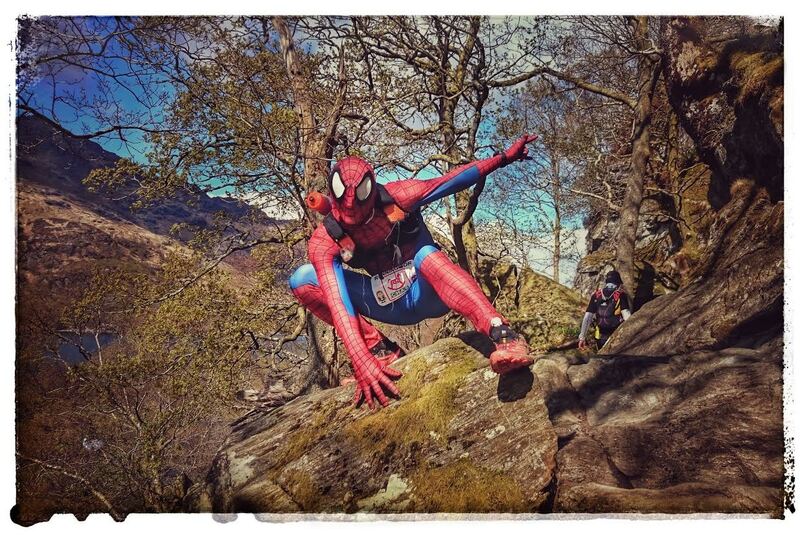 This time was much different though, today I was suiting up and running The Hoka Highland Fling race as Spider-Man! With my Gore thermal and wind proof base layers on, I was ready to take on the elements and was sure that hypothermia concerns were well looked after. The elite runners kick off and soon after that, I’m away in the second wave, finding myself running with my buddy Martin Bell, who I met in Chamonix last year. We shoot the breeze together for a while but as the sun appears for the day, all runners notice the lack of forecasted rain and see the clear skies ahead and feel the early promise of a hot day ahead. With my core well protected and mask offering no cooling option, I begin to feel my body temp rising as I continue to run along. It’s a comfortable pace and Martin and I chat away with each other over the miles until we reach the woodlands just beyond Drymen, heading towards Conic Hill. With my body heat maintaining at a high, the early morning humidity feeling like is not going to drop, mixed with sun that’s beginning to shine, my breathing becomes deep and laboured but comfortable. I have trained in the suit, as well as a previous year with a training mask, so although it’s a laboured process of trail running, I find myself in a groove and running along. This laboured breathing would be my rhythm for the rest of the day. As I hit the accent of Conic Hill, my calves decide to explode and cramp up. I haven’t cramped in years and this hurts! I’m reminding myself to drink fluids but obviously with the change in weather conditions, my layers are not lending themselves to the pace and trails ahead. From out of nowhere a good friend of mine, Kirsty Burnett joins me and asks what’s the matter with my legs. I tell her it’s cramp and with that she introduces me to Succeed tablets. Salt tablets that she promises will sort me out in no more than 5 mins. Just as well, as I was about to approach Graeme Hewitson, the official photographer for the race. The amount of people that gave supportive comments as they ran with me, as well as passing was excellent and I’d like to thank you all for this. I was struggling but you all help pass the miles. 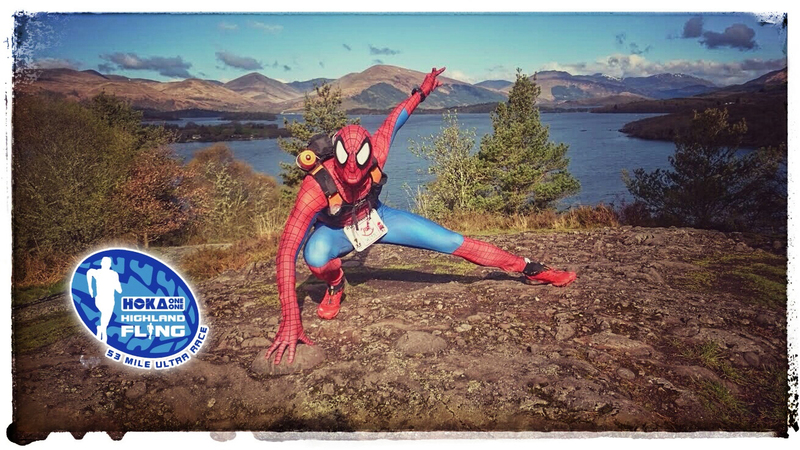 Some did suggest removing the mask, as noone would see and I’d feel much better and my performance would improve but I had to admit to them, that I’m a ‘little’ bloody minded and the challenge was to run as Spidey and I couldn’t allow for a sneaky wee mask removal. The only time I fully removed the mask, was at check points. Whilst running it was lifted to the nose where sweets and drink were guzzled down! I managed to squeeze in a ‘few’ photo opportunities, as you’d expect as well as making new friends. 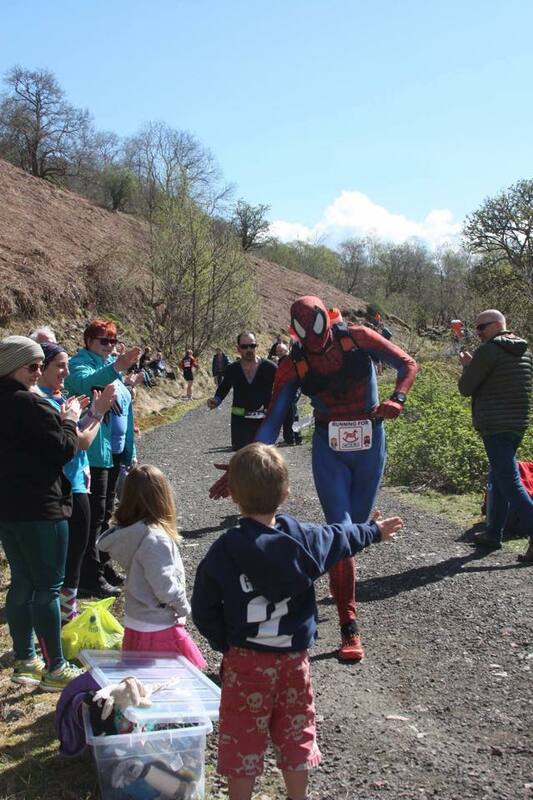 Some even asking for photos on their mobiles, saying that their kids would never believe that mum/dad were out running with Spider-Man today! Just shy of the third check point, I was joined by the infamous Donald Sandeman. The only guy on the course with a suit better than mine! I’ve been following Donald and his love of ultras for a while now, and was fortunate enough to have spent a week with him and others last year for the Transvulcania race. He is a great character and an inspiring runner! Not to mention his mad obsession for Tartan!!!! The terrain, as everyone knows, is monstrous just beyond Inversnaid Hotel, and my concentration here was paramount. I had heard of others in the race that had fallen fowl of a protruding rock or root that took them out of the game. 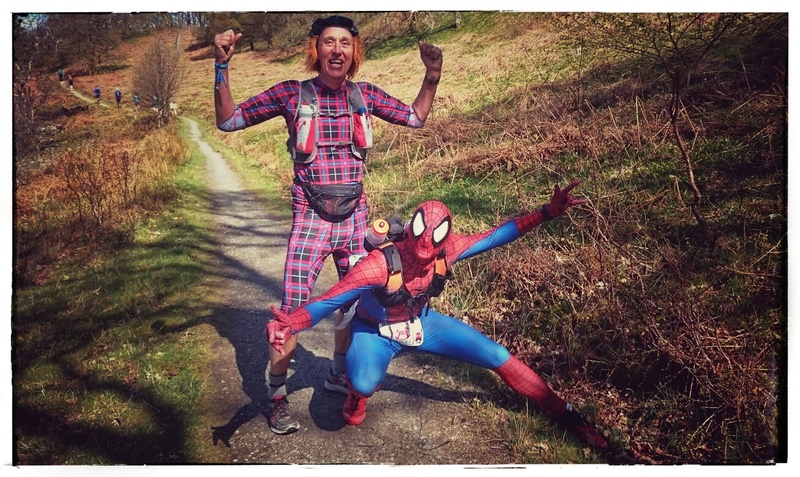 I had my concerns that I had to prove that visibility in this suit was good enough for running on the West Highland Way and this was where every step and drop would be crucial. I catch up with a few runners that are negotiating this technical section and with the overwhelming heat, condensation on my lenses, continually wiping, heavy breathing, gingerly limbering about. I did begin to feel a little sorry for my stubborn predicament of wearing this partiality sighted mask but I would take these times to think of why I was running and how others have to cope with personal issues and disabilities all day, every day, 24/7. And would you believe it but round the next boulder was a team of walkers / guides, that were walking with a team of blind hikers! This was an awesome sight! – pardon the pun! This section is crazy technical, from serious leg breaking drops, and rock slides to exceptionally narrow rock faces that you need to master and have a head for heights. One false slip and you could find yourself slipping into Loch Lomond. This certainly put my slight niggles into perspective, and I’m sure every other runner that past them too. Heat and exhaustion was certain the theme of the day. I huffed and puffed my way to the final official check point. I had further of my own ‘mind mapping’ check points but it was great to have made it to Beinglas – 40.9 miles in. The rest of the run was approached mentally like a morning run to work, with a few more miles added onto the back of it. I was heading for the infamous ‘cow poo alley’, where I met a lady who was struggling. Having already collapsed a few times, by her own admission, she had shredded her hands in these stumbles and were now well blooded. As I asked how she was doing, she broke down and cried. She couldn’t go any further. An error in nutrition had seen her fade and now she was struggling. Never one to pass by a struggling runner, I walked with her and reassured her that all ‘would’ be well, she ‘will’ hit that red carpet and corridor of international flags, welcoming and congratulating her of her achievements. As time passed and we shot the breeze, we realised that we had a lot in common, obviously we like to run daft distances but we both had an interest in yoga, she had quit her accountancy jobs and was looking at her own yoga venture. 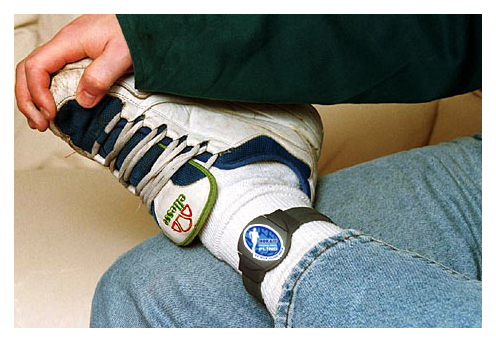 We were also both keen believers of running and biking, as a form of commution, rather than always using the car. She was from Guernsey and said that most destinations were only about two miles, yet most people would drive. She’d already got her kids out of the habit of mum playing taxi driver, as they were all old enough now to walk, run or cycle. Running was still not an option for us at this point, as the risk of, – sorry I think her name was Nikki? But Nikki was still in no state to run, still unsure on her legs. So we shot the breeze through cow poo alley and on up and over the ‘roller coaster’ section. I was telling Nikki all about fast packing, micro adventures and all those other crazy things that I’m into such as barefoot running, bushcraft… Again she was into some of this and had shared a story where she ran and toured a remote area that had a ruined church. This was where she pulled out her yoga mat and enjoyed a night under the stars. A true #microadventure right there. I felt spirits were building a little, as we headed through the wooded trails, so I took this opportunity to take to a ‘call of nature’ – this would be while I warned Nikki. As I emerged from the woods, she was off and away. With only 4 miles to the finish, I took this opportunity to open up the legs again, sure I’d catch her but no, she had her mojo back and was off like the wind! Bobbydazzler!!! Nikki crossed the line and we congratulated each other over a crackin’ warm cup of tomato soup. The BEST soup ever!!! I was now well off my target time and I still had 4 miles to go but they past well and fairly quick. The only issue I noticed was that the low sunshine now gave to a strong lens glare in my eyes. I stubbed my toe on an unseen rock, my vision down to an extreme low. The only thing I could do was have both hands up, acting as a visor, and allow me to see the final tricky miles of this epic race. Emotions build as you begin to hear the bagpipers, marking your welcome and finish of the race. Round one final last corner then there was the red carpet and flags waving. Johnny Fling and his epic team of supporters, welcome you like no other race does! 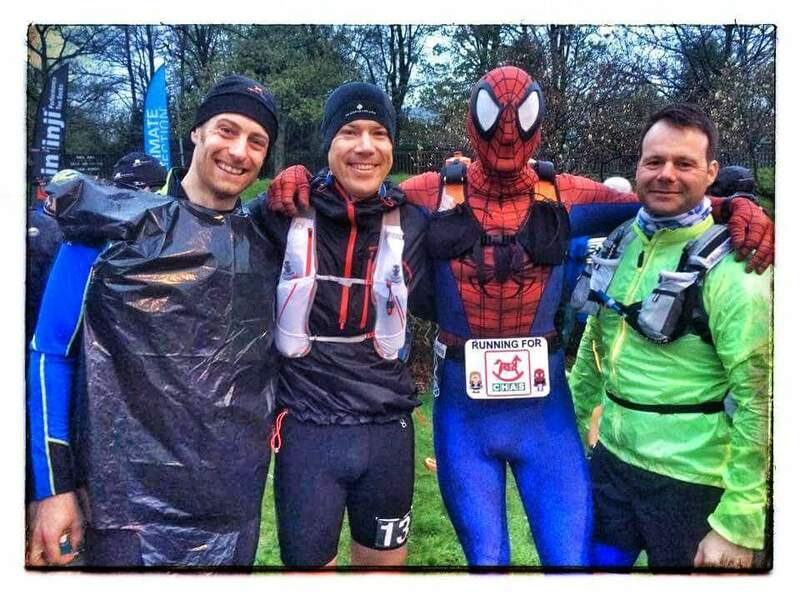 A big Spidey thanks goes to John and his complete crew of volunteers and supporters, for which makes this race second to none. Special thanks goes to my wife Eil and pup Turry for their ever supportive patience, enduring all my demands, multitasking as needed, as well as having that smile and waggy tail, to keep me going – and yup, signing up for another race! 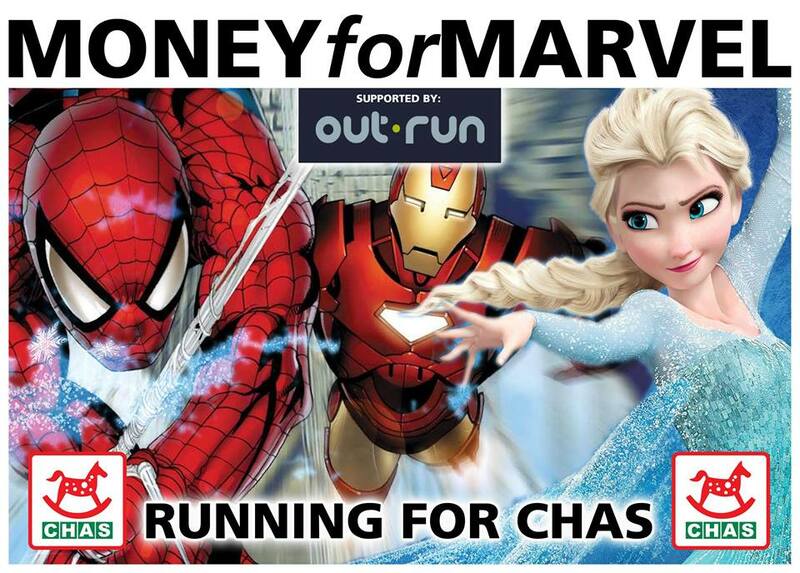 – I’d also like to thank everyone that sponsored me through this race, extra coasters that have been sold through Eilidh, as well as the epic effort put on by Mike, Cat and kids for collecting cash donations for CHAS, through our small ‘Money4Marvel’ campaign. At times, “The best way to help yourself, is to help others!” – Fling complete, no sunburn and not one midge bite – a bobbydazzler day out! Totally Marvel(ous) performance Ross, one of the stand-out achievements in the Fling. Just in awe. Well done, many times over.